Garage Italia and design firm Pininfarina have come together to design this little special series car. Coinciding with Fiat 500's birthday, the iconic 'Spiaggina' makes its as it has been given a new lease of life comes courtesy of the Fiat brand. The new 500 'Spiaggina '58' special series, will be produced in a limited edition of 1,958 cars and pays tribute to the year of the birth of the first "Spiaggina", with ultra-chic design touches and a lavish standard outfit. This is the first of Fiat's two tributes to celebrate both the legendary little car's birthday and the 60th anniversary of its first special series - the unforgettable 500 spiaggina dating from 1958. 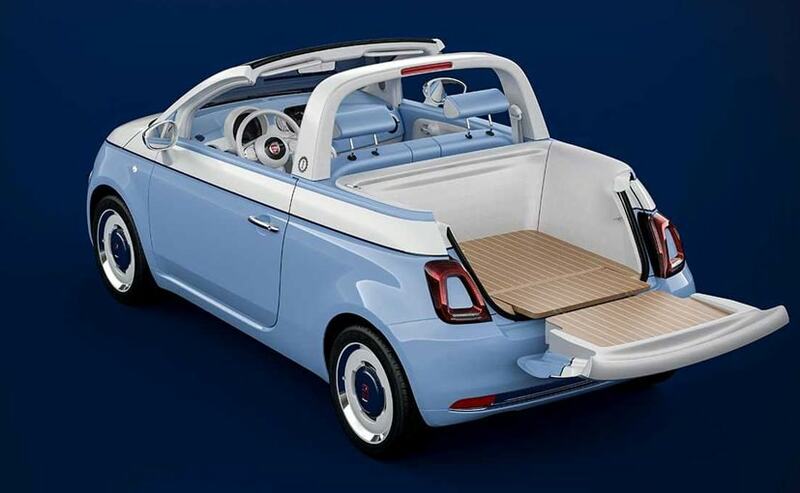 Garage Italia and design firm Pininfarina have come together to design this little special series car. 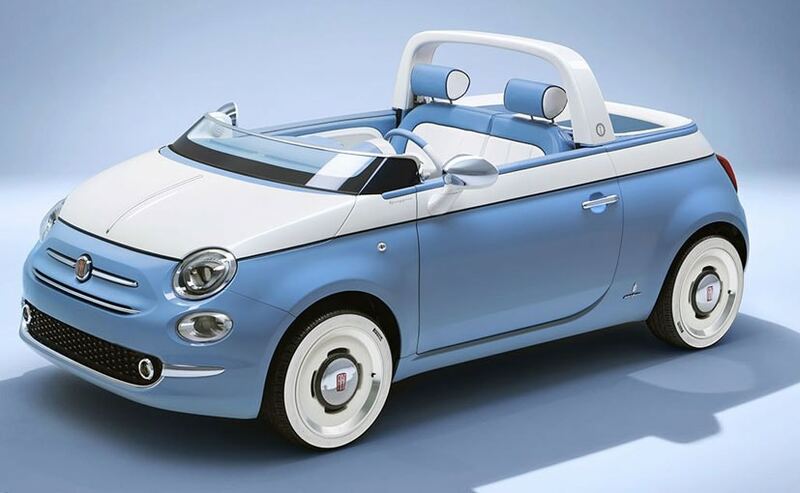 The new 500 Spiaggina wears a Volare Blue livery, with beige soft-top, shown off by the white waistrail and the vintage-design 16-inch alloy wheels. 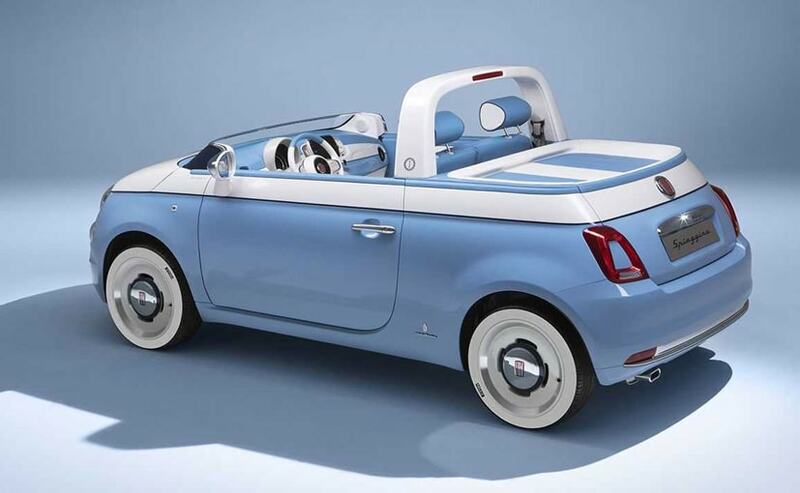 This is an exclusive colour scheme and you also get side moulding with 500 logo, the chromed door mirror caps, the vintage logos and the chromed "Spiaggina '58" name, in elegant italic script, on the rear to "sign" the latest Fiat creation. The interior has the same class and elegance. Starting from the dashboard, in the same Volare Blue colour as the exterior, with a refined two-tone look for the seats, with grey striped base and ivory upper section. The chic interior is completed by specific mats and a steering wheel with vintage logo. The new "Spiaggina '58" special series comes equipped with Uconnect 7" HD LIVE touchscreen radio, Apple CarPlay ready and compatible with Android Auto, as well as navigator with Tom Tom maps and DAB digital radio. All these are of course standard. Also standard are 7" TFT display, automatic A/C, rear parking sensors, height-adjustable seats and seat-back pockets. Finally, the 500 "Spiaggina '58" comes with a choice of the 1.2-litre and 0.9 TwinAir petrol engines, both with the latest Euro6D rating. 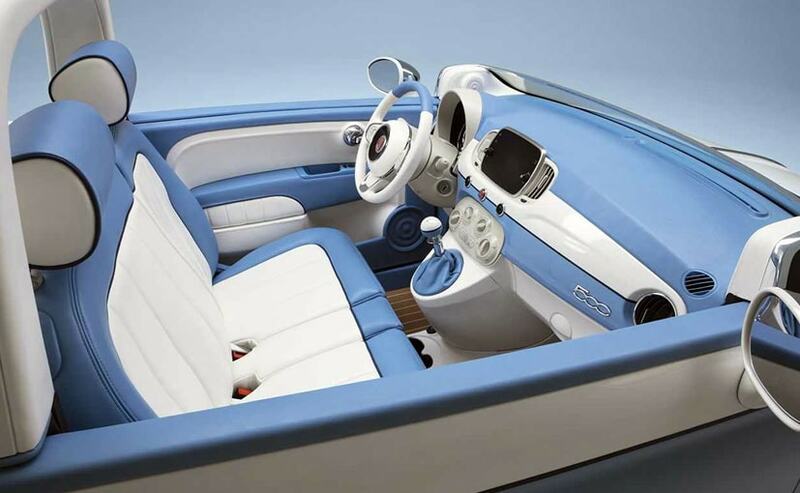 The chic interior of the Fiat 500 Spiaggina 58 is completed by specific mats and a steering wheel with vintage logo. Luca Napolitano, Head of EMEA Fiat and Abarth brands, explains the project as follows: "The new "Spiaggina '58" is our birthday gift to 500 for its birthday and the 60th anniversary of the "spiaggina". It's a real "time machine" incorporating many reminders of the Dolce Vita era, such as the vintage logos and wheels, the white waistrail, the convertible format only and the two-tone interior. Not to mention a special colour just for this series: Volare Blue. A name and a colour that take us straight back to 1958, to the Sanremo Festival of that year, when a young Domenico Modugno teamed up with Johnny Dorelli to give the first public performance of "Nel blu dipinto di blu", the famous song also known as "Volare", the soundtrack for the Dolce Vita years." Lapo Elkann, Chairman and Creative Director of Garage Italia: "11 years have now passed since the model was reborn on 4 July 2007 and today, through Garage Italia, I've decided to celebrate and renew a splendid Italian icon by working with my Design Centre to create the Spiaggina by Garage Italia, styled by my Team with invaluable technical and engineering input from Pininfarina and with the support of the Fiat brand."